Traditional farmhouse cottage where comfort is a byword and the views are second to none. Relax and unwind in the knowledge that you have made your reservation. Please explore this section of our website to find out which rooms might suit your needs and where you might imagine yourself relaxing at the beginning of a new day or the end of one just past. One of the joys of a holiday is a comfortable bedroom with inspiring views to make you feel indulged. Arise in the peace and tranquillity of the Scottish valley, with its soft light and pure air, at the end of the day, cosy beds and a nightcap, snug beneath the moon sinking over the Munros in the distance. Every bedroom has en-suite facilities which are cleaned morning and evening. There is also a discreet turn down service to prepare your room for your return after dinner. All rooms have a telephone and of course, a complementary WiFi internet access is available throughout the house. All bedrooms are furnished with paintings, lamps, books and antique furniture to ensure they are pleasant and relaxing. Each bathroom has heated towel rails so our generous sized towels are always ready for you, and with our compliments there are a selection of luxury toiletries and white towelling robes. 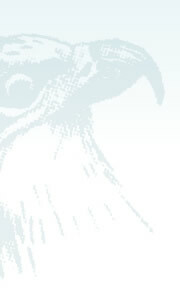 Named after the magnificent Sea Eagle, Osprey is a bedroom in the grandest of styles. There is even a chaise longue to take advantage of some quiet time enjoying the sunshine which pours in all day. 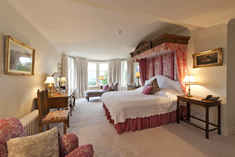 This bedroom looks out over Pitcastle’s beautiful gardens and out beyond to the hills in the West…Early in the morning, pheasants patrol on the lawn and in the evening, glorious sunsets illuminate the room. Curlew is a lovely room with bay windows looking down onto the valley below. The morning sun wakes you and if your window is open you’ll hear the haunting cry of the buzzards as they circle almost at eye level…and late at night you’ll hear the hoot of the owls as they take to the air. The view from the bay window is similar to Osprey’s with the whole sweep of Strathtay valley laid out before it. This bedroom has a lovely old fashioned feel to it and is wonderfully restful. Mallard is on the upper floor and has cosy ‘coombe’ ceilings. On clear nights you can see the stars caught in the top branches of the Pine trees and hear the nocturnal wildlife awaken for its nightly hunt. Snipe is a beautifully peaceful room with views to the East and down the valley. With a roll-top bath offering an indulgent half hour at the end of a day, this is the perfect room in which to relax after an afternoon on the hills. If our Highland cows, Moira and Olga are in the field, be sure to go and introduce yourself before breakfast! Teal, a twin-bed room on the upper floor and has coombe ceilings. This can be the perfect room for young children who can have early bedtimes and won’t be disturbed by activity in the rest of the house. 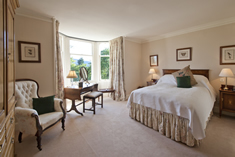 Raven is a twin room with a lovely view of the courtyard and the tall pine trees behind. If you watch carefully you’ll see red squirrels busy amongst the branches. Capercaillie is a small appartment accessible from the inside and the outside of the house. It has coombe ceilings and view on the garden and on the tall pine trees behind the house. It has a bedroom, a bathroom a sitting room and a little kitchen. At the end of a long day out on the hill or in the morning after the perfect slumber, Pitcastle dining room welcomes you in true Scottish style. A full Scottish breakfast awaits you, and on warm summer mornings the original bow French windows will be open for you to take in the outstanding landscape of the valley below. In the evening, under the warm ambience of the chandelier above the table, table silver and crisp napkins, not to mention our friendly and professional waiter, you and your guests can relax and indulge in the finest Scottish cuisine, courtesy of our Chef (name). The oval table seats 16 guests comfortably. 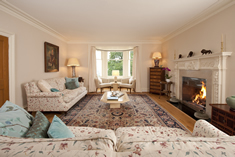 Traditionally the Drawing Room is the calm centre of a household and this is certainly true at Pitcastle. Sit in one bay window drinking coffee and enjoying the view and the warmth of the sun streaming in or stroll out onto the terrace through the French window and the name of the game is relaxation. Recently refurbished with an oak floor, ample seating and the beautifully restored original mantle piece, this is a special room. It has the wonderful calm of a by-gone age but with all the advantages of modern technology. This is a special room, panelled in Oak with an open log fire and comfortable leather sofas and armchairs where we serve after-dinner coffee and a generously stocked bar for guests to help themselves. It is the perfect place to unwind. Many of our guests book after-dinner entertainment – Story tellers dramatically bringing Scotland’s history to life or perhaps the Three Divas encouraging you to sing along to unforgettable songs from the big shows. We’ve even had guests partake in a spot of whisky tasting, after all, Pitcastle is in the heart of some of the most famous Whisky Distilleries in the country. On the occasional day when the weather won’t let you out to play, or when you just want to relax around the house, the Family Room is well stocked with board games and books. Sky TV and a DVD player are also available. This is a cosy room with a lovely view over the garden and the perfect place to read the morning papers, write a letter at the desk or log-on to your laptop and catch-up with your emails. Smaller parties often congregate here after dinner to enjoy an informal whisky tasting session in the atmosphere of a Gentleman’s smoking room. The guardian spirit of the room is a trophy stag head shot on Pitcastle.